The 2011 City of Sydney Peace Prize Lecture was delivered to a sold-out crowd at Sydney Town Hall on Wednesday 2nd November, by the 2011 Sydney Peace Prize Recipient, Prof Noam Chomsky. 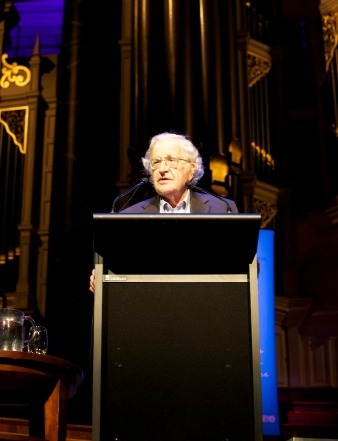 Prof Noam Chomsky’s City of Sydney Peace Prize Lecture will be broadcast on the ABC’s Big Ideas on Wednesday 30th November at 11am on ABC1. Click here for a link to ABC Big Ideas. In scholarship, this dramatic transition is often attributed to the thesis of the “democratic peace”: democracies do not go to war with one another. Not to be overlooked, however, is that Europeans came to realize that the next time they indulge in their favorite pastime of slaughtering one another, the game will be over: civilization has developed means of destruction that can only be used against those too weak to retaliate in kind, a large part of the appalling history of the post-World War II years. It is not that the threat has ended. US-Soviet confrontations came painfully close to virtually terminal nuclear war in ways that are shattering to contemplate, when we inspect them closely. And the threat of nuclear war remains all too ominously alive, a matter to which I will briefly return. Can we proceed to at least limit the scourge of war? One answer is given by absolute pacifists, including people I respect though I have never felt able to go beyond that. A somewhat more persuasive stand, I think, is that of the pacifist thinker and social activist A.J. Muste, one of the great figures of 20th century America, in my opinion: what he called “revolutionary pacifism.” Muste disdained the search for peace without justice. He urged that “one must be a revolutionary before one can be a pacifist” – by which he meant that we must cease to “acquiesce [so] easily in evil conditions,” and must deal “honestly and adequately with this ninety percent of our problem” – “the violence on which the present system is based, and all the evil – material and spiritual – this entails for the masses of men throughout the world.” Unless we do so, he argued, “there is something ludicrous, and perhaps hypocritical, about our concern over the ten per cent of the violence employed by the rebels against oppression” – no matter how hideous they may be. He was confronting the hardest problem of the day for a pacifist, the question whether to take part in the anti-fascist war. In writing about Muste’s stand 45 years ago, I quoted his warning that “The problem after a war is with the victor. He thinks he has just proved that war and violence pay. Who will teach him a lesson?” His observation was all too apt at the time, while the Indochina wars were raging. And on all too many other occasions since. The allies did not fight “the good war,” as it is commonly called, because of the awful crimes of fascism. Before their attacks on western powers, fascists were treated rather sympathetically, particularly “that admirable Italian gentleman,” as FDR called Mussolini. Even Hitler was regarded by the US State Department as a “moderate” holding off the extremists of right and left. The British were even more sympathetic, particularly the business world. Roosevelt’s close confidant Sumner Welles reported to the president that the Munich settlement that dismembered Czechoslovakia “presented the opportunity for the establishment by the nations of the world of a new world order based upon justice and upon law,” in which the Nazi moderates would play a leading role. As late as April 1941, the influential statesman George Kennan, at the dovish extreme of the postwar planning spectrum, wrote from his consular post in Berlin that German leaders have no wish to “see other people suffer under German rule,” are “most anxious that their new subjects should be happy in their care,” and are making “important compromises” to assure this benign outcome. Though by then the horrendous facts of the Holocaust were well known, they scarcely entered the Nuremberg trials, which focused on aggression, “the supreme international crime differing only from other war crimes in that it contains within itself the accumulated evil of the whole”: in Indochina, Iraq, and all too many other places where we have much to contemplate. The horrifying crimes of Japanese fascism were virtually ignored in the postwar peace settlements. Japan’s aggression began exactly 80 years ago, with the staged Mukden incident, but for the West, it began 10 years later, with the attack on military bases in two US possessions. India and other major Asian countries refused even to attend the 1951 San Francisco Peace Treaty conference because of the exclusion of Japan’s crimes in Asia – and also because of Washington’s establishment of a major military base in conquered Okiniwa, still there despite the energetic protests of the population. It is useful to reflect on several aspects of the Pearl Harbor attack. One is the reaction of historian and Kennedy advisor Arthur Schlesinger to the bombing of Baghdad in March 2003. He recalled FDR’s words when Japan bombed Pearl Harbor on “a date which will live in infamy.” “Today it is we Americans who live in infamy,” Schlesinger wrote, as our government adopts the policies of imperial Japan – thoughts that were barely articulated elsewhere in the mainstream, and quickly suppressed: I could find no mention of this principled stand in the praise for Schlesinger’s accomplishments when he died a few years later. We can also learn a lot about ourselves by carrying Schlesinger’s lament a few steps further. By today’s standards, Japan’s attack was justified, indeed meritorious. Japan, after all, was exercising the much lauded doctrine of anticipatory self-defense when it bombed military bases in Hawaii and the Philippines, two virtual US colonies, with reasons far more compelling than anything that Bush and Blair could conjure up when they adopted the policies of imperial Japan in 2003. Japanese leaders were well aware that B-17 Flying Fortresses were coming off the Boeing production lines, and they could read in the American press that these killing machines would be able to burn down Tokyo, a “city of rice-paper and wood houses.” A November 1940 plan to “bomb Tokyo and other big cities” was enthusiastically received by Secretary of State Cordell Hull. FDR was “simply delighted” at the plans “to burn out the industrial heart of the Empire with fire-bomb attacks on the teeming bamboo ant heaps of Honshu and Kyushu,” outlined by their author, Air Force General Chennault. By July 1941, the Air Corps was ferrying B-17s to the Far East for this purpose, assigning half of all the big bombers to this region, taking them from the Atlantic sea-lanes. They were to be used if needed “to set the paper cities of Japan on fire,” according to General George Marshall, Roosevelt’s main military adviser, in a press briefing three weeks before Pearl Harbor. Four days later, New York Times senior correspondent Arthur Krock reported US plans to bomb Japan from Siberian and Philippine bases, to which the Air Force was rushing incendiary bombs intended for civilian targets. The US knew from decoded messages that Japan was aware of these plans. History provides ample evidence to support Muste’s conclusion that “The problem after a war is with the victor, [who] thinks he has just proved that war and violence pay.” And the real answer to Muste’s question, “Who will teach him a lesson?,” can only be domestic populations, if they can adopt elementary moral principles. Even the most uncontroversial of these principles could have a major impact on ending injustice and war. Consider the principle of universality, perhaps the most elementary of moral principles: we apply to ourselves the standards we apply to others, if not more stringent ones. The principle is universal, or nearly so, in three further respects: it is found in some form in every moral code; it is universally applauded in words, and consistently rejected in practice. The facts are plain, and should be troublesome. The principle has a simple corollary, which suffers the same fate: we should distribute finite energies to the extent that we can influence outcomes, typically on cases for which we share responsibility. We take that for granted with regard to enemies. No one cares whether Iranian intellectuals join the ruling clerics in condemnation of the crimes of Israel or the United States. Rather, we ask what they say about their own state. We honored Soviet dissidents on the same grounds. Of course, that is not the reaction within their own societies. There dissidents are condemned as “anti-Soviet” or supporters of the Great Satan, much as their counterparts here are condemned as “anti-American” or supporters of today’s official enemy. And of course, punishment of those who adhere to elementary moral principles can be severe, depending on the nature of the society. In Soviet-run Czechoslovakia, for example, Vaclav Havel was imprisoned. At the same time, in US-run El Salvador his counterparts had their brains blown out by an elite battalion fresh from renewed training at the John F. Kennedy School of Special Warfare in North Carolina, acting on explicit orders of the High Command, which had intimate relations with Washington. We all know and respect Havel for his courageous resistance, but who can even name the leading Latin American intellectuals, Jesuit priests, who were added to the long bloody trail of the Atlacatl brigade shortly after the fall of the Berlin Wall – along with their housekeeper and daughter, since the orders were to leave no witnesses? Before we hear that these are exceptions, we might recall a truism of Latin American scholarship, reiterated by historian John Coatsworth in the recently published Cambridge University History of the Cold War: from 1960 to “the Soviet collapse in 1990, the numbers of political prisoners, torture victims, and executions of nonviolent political dissenters in Latin America vastly exceeded those in the Soviet Union and its East European satellites.” Among the executed were many religious martyrs, and there were mass slaughters as well, consistently supported or initiated by Washington. And the date 1960 is highly significant, for reasons we should all know, but I cannot go into here. In the West all of this is “disappeared,” to borrow the terminology of our Latin American victims. Regrettably, these are persistent features of intellectual and moral culture, which we can trace back to the earliest recorded history. I think they richly underscore Muste’s injunction. If we ever hope to live up to the high ideals we passionately proclaim, and to bring the initial dream of the United Nations closer to fulfillment, we should think carefully about crucial choices that have been made, and continue to be made every day – not forgetting “the violence on which the present system is based, and all the evil – material and spiritual – this entails for the masses of men throughout the world.” Among these masses are 6 million children who die every year because of lack of simple medical procedures that the rich countries could make available within statistical error in their budgets. And a billion people on the edge of starvation or worse, but not beyond reach by any means. We should also never forget that our wealth derives in no small measure from the tragedy of others. That is dramatically clear in the Anglosphere. I live in a comfortable suburb of Boston. Those who once lived there were victims of “the utter extirpation of all the Indians in most populous parts of the Union” by means “more destructive to the Indian natives than the conduct of the conquerors of Mexico and Peru” – the verdict of the first Secretary of War of the newly liberated colonies, General Henry Knox. They suffered the fate of “that hapless race of native Americans, which we are exterminating with such merciless and perfidious cruelty…among the heinous sins of this nation, for which I believe God will one day bring [it] to judgement” – the words of the great grand strategist John Quincy Adams, intellectual author of Manifest Destiny and the Monroe Doctrine, long after his own substantial contributions to these heinous sins. Australians should have no trouble adding illustrations. Whatever the ultimate judgment of God may be, the judgment of man is far from Adams’s expectations. To mention a few recent cases, consider what I suppose are the two most highly regarded left-liberal intellectual journals in the Anglosphere, the New York and London Reviews of Books. In the former, a prominent commentator recently reported what he learned from the work of the “heroic historian” Edmund Morgan: namely, that when Columbus and the early explorers arrived they “found a continental vastness sparsely populated by farming and hunting people . . . . In the limitless and unspoiled world stretching from tropical jungle to the frozen north, there may have been scarcely more than a million inhabitants.” The calculation is off by tens of millions, and the “vastness” included advanced civilizations, facts well known to those who choose to know decades ago. No letters appeared reacting to this truly colossal case of genocide denial. In the companion London journal a noted historian casually mentioned the “mistreatment of the Native Americans,” again eliciting no comment. We would hardly accept the word “mistreatment” for comparable or even much lesser crimes committed by enemies. Recognition of heinous crimes from which we benefit enormously would be a good start after centuries of denial, but we can go on from there. One of the main tribes where I live was the Wampanoag, who still have a small reservation not too far away. Their language has long ago disappeared. But in a remarkable feat of scholarship and dedication to elementary human rights, the language has been reconstructed from missionary texts and comparative evidence, and now has its first native speaker in 100 years, the daughter of Jennie Little Doe, who has become a fluent speaker of the language herself. She is a former graduate student at MIT, who worked with my late friend and colleague Kenneth Hale, one of the most outstanding linguists of the modern period. Among his many accomplishments was his leading role in founding the study of aboriginal languages of Australia. He was also very effective in defense of the rights of indigenous people, also a dedicated peace and justice activist. He was able to turn our department at MIT into a center for the study of indigenous languages and active defense of indigenous rights in the Americas and beyond. Revival of the Wampanoag language has revitalized the tribe. A language is more than just sounds and words. It is the repository of culture, history, traditions, the entire rich texture of human life and society. Loss of a language is a serious blow not only to the community itself but to all of those who hope to understand something of the nature of human beings, their capacities and achievements, and of course a loss of particular severity to those concerned with the variety and uniformity of human languages, a core component of human higher mental faculties. Similar achievements can be carried forward, a very partial but significant gesture towards repentance for heinous sins on which our wealth and power rests. Since we commemorate anniversaries, such as the Japanese attacks 70 years ago, there are several significant ones that fall right about now, with lessons that can serve for both enlightenment and action. I will mention just a few. The West has just commemorated the tenth anniversary of the 9/11 terrorist attacks and what was called at the time, but no longer, “the glorious invasion” of Afghanistan that followed, soon to be followed by the even more glorious invasion of Iraq. Partial closure for 9/11 was reached with the assassination of the prime suspect, Osama bin Laden, by US commandos who invaded Pakistan, apprehended him and then murdered him, disposing of the corpse without autopsy. I said “prime suspect,” recalling the ancient though long-abandoned doctrine of “presumption of innocence.” The current issue of the major US scholarly journal of international relations features several discussions of the Nuremberg trials of some of history’s worst criminals. There we read that the “U.S. decision to prosecute, rather than seek brutal vengeance was a victory for the American tradition of rights and a particularly American brand of legalism: punishment only for those who could be proved to be guilty through a fair trial with a panoply of procedural protections.” The journal appeared right at the time of the celebration of the abandonment of this principle in a dramatic way, while the global campaign of assassination of suspects, and inevitable “collateral damage,” continues to be expanded, to much acclaim. Not to be sure universal acclaim. Pakistan’s leading daily recently published a study of the effect of drone attacks and other US terror. It found that “About 80 per cent [of] residents of [the tribal regions] South and North Waziristan agencies have been affected mentally while 60 per cent people of Peshawar are nearing to become psychological patients if these problems are not addressed immediately,” and warned that the “survival of our young generation” is at stake. In part for these reasons, hatred of America had already risen to phenomenal heights, and after the bin Laden assassination increased still more. One consequence was firing across the border at the bases of the US occupying army in Afghanistan – which provoked sharp condemnation of Pakistan for its failure to cooperate in an American war that Pakistanis overwhelmingly oppose, taking the same stand they did when the Russians occupied Afghanistan. A stand then lauded, now condemned. The specialist literature and even the US Embassy in Islamabad warn that the pressures on Pakistan to take part in the US invasion, as well as US attacks in Pakistan, are “destabilizing and radicalizing Pakistan, risking a geopolitical catastrophe for the United States – and the world – which would dwarf anything that could possibly occur in Afghanistan” – quoting British military/Pakistan analyst Anatol Lieven. The assassination of bin Laden greatly heightened this risk in ways that were ignored in the general enthusiasm for assassination of suspects. The US commandos were under orders to fight their way out if necessary. They would surely have had air cover, maybe more, in which case there might have been a major confrontation with the Pakistani army, the only stable institution in Pakistan, and deeply committed to defending Pakistan’s sovereignty. Pakistan has a huge nuclear arsenal, the most rapidly expanding in the world. And the whole system is laced with radical Islamists, products of the strong US-Saudi support for the worst of Pakistan’s dictators, Zia ul-Haq, and his program of radical Islamization. This program along with Pakistan’s nuclear weapons are among Ronald Reagan’s legacies. Obama has now added the risk of nuclear explosions in London and New York, if the confrontation had led to leakage of nuclear materials to jihadis, as was plausibly feared – one of the many examples of the constant threat of nuclear weapons. The assassination of bin Laden had a name: “Operation Geronimo.” That caused an uproar in Mexico, and was protested by the remnants of the indigenous population in the US. But elsewhere few seemed to comprehend the significance of identifying bin Laden with the heroic Apache Indian chief who led the resistance to the invaders, seeking to protect his people from the fate of “that hapless race” that John Quincy Adams eloquently described. The imperial mentality is so profound that such matters cannot even be perceived. There were a few criticisms of Operation Geronimo – the name, the manner of its execution, and the implications. These elicited the usual furious condemnations, most unworthy of comment, though some were instructive. The most interesting was by the respected left-liberal commentator Matthew Yglesias. He patiently explained that “one of the main functions of the international institutional order is precisely to legitimate the use of deadly military force by western powers,” so it is “amazingly naïve” to suggest that the US should obey international law or other conditions that we impose on the powerless. The words are not criticism, but applause; hence one can raise only tactical objections if the US invades other countries, murders and destroys with abandon, assassinates suspects at will, and otherwise fulfills its obligations in the service of mankind. If the traditional victims see matters somewhat differently, that merely reveals their moral and intellectual backwardness. And the occasional Western critic who fails to comprehend these fundamental truths can be dismissed as “silly,” Yglesias explains – incidentally, referring specifically to me, and I cheerfully confess my guilt. Going back a decade to 2001, from the first moment it was clear that the “glorious invasion” was anything but that. It was undertaken with the understanding that it might drive several million Afghans over the edge of starvation, which is why the bombing was bitterly condemned by the aid agencies that were forced to end the operations on which 5 million Afghans depended for survival. Fortunately the worst did not happen, but only the most morally obtuse can fail to comprehend that actions are evaluated in terms of likely consequences, not actual ones. The invasion of Afganistan was not aimed at overthrowing the brutal Taliban regime, as later claimed. That was an afterthought, brought up three weeks after the bombing began. Its explicit reason was that the Taliban were unwilling to extradite bin Laden without evidence, which the US refused to provide – as later learned, because it had virtually none, and in fact still has little that could stand up in an independent court of law, though his responsibility is hardly in doubt. The Taliban did in fact make some gestures towards extradition, and we since have learned that there were other such options, but they were all dismissed in favor of violence, which has since torn the country to shreds. It has reached its highest level in a decade this year according to the UN, with no diminution in sight. These are among the natural consequences of rejecting Muste’s warning, and the main thrust of his revolutionary pacifism, which should direct us to investigating the grievances that lead to violence, and when they are legitimate, as they often are, to address them. When that advice is taken, it can succeed very well. Britain’s recent experience in Northern Ireland is a good illustration. For years, London responded to IRA terror with greater violence, escalating the cycle, which reached a bitter peak. When the government began instead to attend to the grievances, violence subsided and terror has effectively disappeared. I was in Belfast in 1993, when it was a war zone, and returned a year ago to a city with tensions, but hardly beyond the norm. There is a great deal more to say about what we call 9/11 and its consequences, but I do not want to end without at least mentioning a few more anniversaries. Right now happens to be the 50th anniversary of President Kennedy’s decision to escalate the conflict in South Vietnam from vicious repression, which had already killed tens of thousands of people and finally elicited a reaction that the client regime in Saigon could not control, to outright US invasion: bombing by the US Air Force, use of napalm, chemical warfare soon including crop destruction to deprive the resistance of food, and programs to send millions of South Vietnamese to virtual concentration camps where they could be “protected” from the guerrillas who, admittedly, they were supporting. There is no time to review the grim aftermath, and there should be no need to do so. The wars left three countries devastated, with a toll of many millions, not including the miserable victims of the enormous chemical warfare assault, including newborn infants today. There were a few at the margins who objected – “wild men in the wings,” as they were termed by Kennedy-Johnson National Security Adviser McGeorge Bundy, former Harvard Dean. And by the time that the very survival of South Vietnam was in doubt, popular protest became quite strong. At the war’s end in 1975, about 70% of the population regarded the war as “fundamentally wrong and immoral,” not “a mistake,” figures that were sustained as long as the question was asked in polls. In revealing contrast, at the dissident extreme of mainstream commentary the war was “a mistake” because our noble objectives could not be achieved at a tolerable cost. Another anniversary that should be in our minds today is of the massacre in the Santa Cruz graveyard in Dili just 20 years ago, the most publicized of a great many shocking atrocities during the Indonesian invasion and annexation of East Timor. Australia had joined the US in granting formal recognition to the Indonesian occupation, after its virtually genocidal invasion. The US State Department explained to Congress in 1982 that Washington recognized both the Indonesian occupation and the Khmer Rouge-based “Democratic Kampuchea” regime. The justification offered was that “unquestionably” the Khmer Rouge were “more representative of the Cambodian people than Fretilin was of the Timorese people” because “there has been this continuity [in Cambodia] since the very beginning,” in 1975, when the Khmer Rouge took over. The media and commentators have been polite enough to all this languish in silence, not an inconsiderable feat. A few months before the Santa Cruz massacre, Foreign Minister Gareth Evans made his famous statements dismissing concerns about the murderous invasion and annexation on the grounds that “the world is a pretty unfair place,…littered…with examples of acquisitions of force,” so we can therefore look away as awesome crimes continue with strong support by the western powers. Not quite look away, because at the same time Evans was negotiating the robbery of East Timor’s sole resource with his comrade Ali Alatas, foreign minister of Indonesia, producing what seems to be the only official western document that recognizes East Timor as an Indonesian province. Years later, Evans declared that “the notion that we had anything to answer for morally or otherwise over the way we handled the Indonesia-East Timor relationship, I absolutely reject” – a stance that can be adopted, and even respected, by those who emerge victorious. In the US and Britain, the question is not even asked in polite society. It is only fair to add that in sharp contrast, much of the Australian population, and media, were in the forefront of exposing and protesting the crimes, some of the worst of the past half-century. And in 1999, when the crimes were escalating once again, they had a significant role in convincing US president Clinton to inform the Indonesian generals in September that the game was over, at which point they immediately withdrew allowing an Australian-led peacekeeping force to enter. There are lessons here too, for the public. Clinton’s orders could have been delivered at any time in the preceding 25 years, terminating the crimes. Clinton himself could easily have delivered them four years earlier, in October 2005, when General Suharto was welcomed to Washington as “our kind of guy.” The same orders could have been given 20 years earlier, when Henry Kissinger gave the “green light” to the Indonesian invasion, and UN Ambassador Daniel Patrick Moynihan expressed his pride in having rendered the United Nations “utterly ineffective” in any measures to deter the Indonesian invasion – later to be revered for his courageous defense of international law. Consistent with Muste’s “revolutionary pacifism,” the Sydney Peace Foundation has always emphasized peace with justice. The demands of justice can remain unfulfilled long after peace has been declared. The Santa Cruz massacre 20 years ago can serve as an illustration. One year after the massacre the United Nations adopted The Declaration on the Protection of All Persons from Enforced Disappearance, which states that “Acts constituting enforced disappearance shall be considered a continuing offence as long as the perpetrators continue to conceal the fate and the whereabouts of persons who have disappeared and these facts remain unclarified.” The massacre is therefore a continuing offence: the fate of the disappeared is unknown, and the offenders have not been brought to justice, including those who continue to conceal the crimes of complicity and participation. Only one indication of how far we must go to rise to some respectable level of civilized behavior.